Zaxby’s: FREE Kidz Meal on Their Birthday! 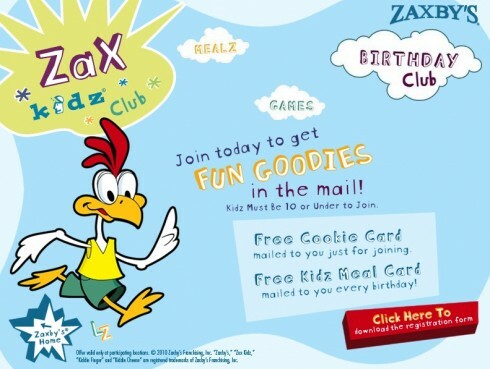 Sign your kids 10 and under up for the Zax Kidz Club at Zaxby’s, and your child will receive a FREE Kidz Meal for their birthday! Happy Birthday! tried to register my 4 year old for the birthday meal card. Website states that she does not meet the age requirements. Website states 10 and under and she is 4. Whats up with that? I am trying to change the address that we have moved from to another. Could someone please contact me? Thanks in advance!! I am the parent of Patrick McCovery and Zyon McMillan, we have recently moved from 6206 5Th Street, Bessemer AL. Our new address where you all can mail their offers, which they enjoy dearly is P.O. Box 272 Mulga, Al 35118. And we thank you so much for every offer. If you have any questions please email me back. Thank you in advance!! Please sign up my 3 year old for Zaxby kidz Birthday club.